Shropshire amateur Ashley Chesters bounced back from his late first-day collapse to book himself a weekend at The Open at St Andrews. Chesters, who missed the cut by just a shot on his Open debut at Hoylake a year ago, had dropped four shots in his three holes the night before. But he carded a second-round 72 to end one under, along with playing partner and fellow Midlander Andy Sullivan. "Ashley handled himself fantastically well," Sullivan told BBC Sport. "He's a good kid and nothing much fazes him. We played together and against each other a lot as an amateur. It was nice to play with each other." On Thursday evening, just as the overnight storm was starting to brew up, Chesters stood on the 16th tee on five under, second only to Danny Willett, as the day's leading Englishman. But he then finished bogey, bogey, double-bogey to card a one-under-par 71. He put his approach on the green at 18, only to see it spin back into Costantino Rocca's Valley of Sin, from which he took another four shots to get down. Nuneaton's Andy Sullivan went into the 144th Open Championship as England's seventh best golfer, at 54th in the Official World Golf Rankings, having won twice out in South Africa in the first three months of this year. Wem's Ashley Chesters made his Open debut at Hoylake a year ago, missing the cut by just a shot. 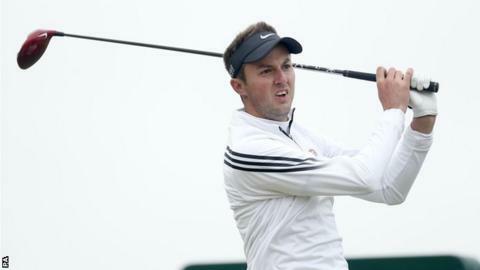 He has held off turning professional again so that he could play this week, having qualified for the second year running by successfully defending his European Amateur title. "It was a horror show," admitted Chesters. "But I'd have settled for one under at the start of the day." After his poor finish the night before, it looked like there might be a hangover when Chesters bogeyed the second. He then bounced back by birdieing the 5th and the 9th to go out in 35 shots - one-under par. And, although he let two more shots go at 12 and 14, he birdied the 15th and safely got his par at 18. "All I wanted to do was make sure it got past the hole. I think it made my family and the friends, who were up watching me, a little happier than they were the night before." As for Nuneaton's Sullivan, after beginning the day on level par, he got off to a great start with birdies at the first three holes. He then dropped shots at 9, 11 and 13 before a birdie at 14 got him back under the card again. Although he bogeyed 17, he got it back at the 18th when he pitched to three feet to join Chesters back on one under.